The National Weather Service hasn’t yet (as of press time) determined whether a tornado visited areas southwest of Red Feather Lakes on May 22, but Crystal Lakes resident Greg Lisco says that one definitely touched down near the Pot Belly restaurant. Lisco encountered heavy rain and hail while driving west from the Boy Scout Ranch turnoff on CR 74E at about 2:15 p.m. and spotted the large funnel cloud west of the village a short time later. Lisco observed the tornado and took pictures of it from the Pot Belly restaurant, on CR 74E just west of the village. 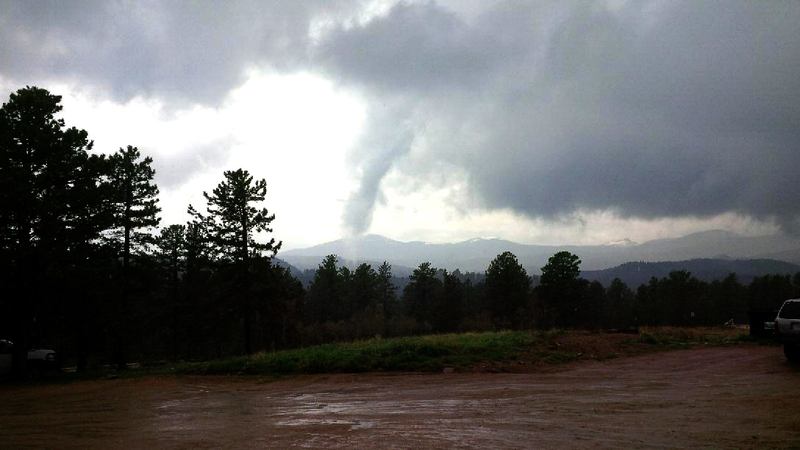 Several second-hand accounts of funnel clouds and of a tornado touching down “above Deadman” were given at both the Red Feather Super and the Trading Post in the village. Rob Allman of Ramona Lake Cabins captured some video of rotating clouds west of the village (video embedded below), or about 1/2 mile north of where Lisco spotted the tornado. Ramona Lake Cabins owner Rob Allman said the clouds were whipping every direction west of the village and hail was followed by heavy rain. Allman captured video of a cloud that was rotating southwest of Ramona Lake that began to drop down to form a funnel, but then quickly disappeared. Linda Bell lives east of Red Feather Lakes and watched the skies turn dark. Poudre Valley REA reported that the May 22 storm knocked out power to about 2,000 customers around Red Feather Lakes, but the company’s online outage tracking map showed that almost all power had been restored by May 23. Bellaire Lake Campground area near Red Feather Lakes is closed until further notice while U.S. Forest Service personnel clear trees damaged from the thunderstorm. More than 200 trees were knocked over from what the Forest Service is calling a “high-wind event.” The closure included Molly Lake Trailhead and dispersed campsites along the Manhattan Road. A Roosevelt Hotshot crew began clean-up work at the campground site on May 23. Red Feather Lakes sits an an elevation of 7,890 feet. In 1987, a tornado was reported at nearby Pingree Park, which is at an elevation of 9,000 feet. What could Wellington's main street look like?